300 x 205 mm. – ff. , CVII, , LXXVII,  (incl. 2 blank leaves). II: ff. . With xylographic title-page, numerous woodcut ornamental initials, 24 (13 repeated) large historiated woodcut initials, and 21 full-page woodcuts in the Apocalypse. This is the first edition of the groundbreaking New Testament in German, translated by Martin Luther from the Greek original text. Luther took only eleven weeks for this translation, beginning mid-December 1521 and working until early March 1522. The translation took place at Wartburg castle during his exile, whereto he had been abducted on 4 May 1521, in order to protect him against the threat of the Emperor's ban. In Wittenberg, Luther revised his New Testament text in collaboration with Melanchthon. The manuscript later went to press, published by Lucas Cranach and the councilman Christian Döring, while Melchior Lotter the Younger executed the printing. It is estimated that the print run numbered between 3,000 and 5,000 copies. In September 1522, Das Newe Testament Deutzsch was ready for sale and is thus known as the September Testament. The first edition was sold out within a few weeks; a new edition appeared as early as December (December Testament), revised and corrected in many places. Only in the following years were Luther and his collaborators able to complete the German translation of the Old Testament. The whole Bible was thus first published in 1534.
condemned the pervasive ritual of worshipping images instead of God. He made an exception for the Book of Revelation, however, as he thought that this book's content would be too complex to be understood without the aid of illustration. 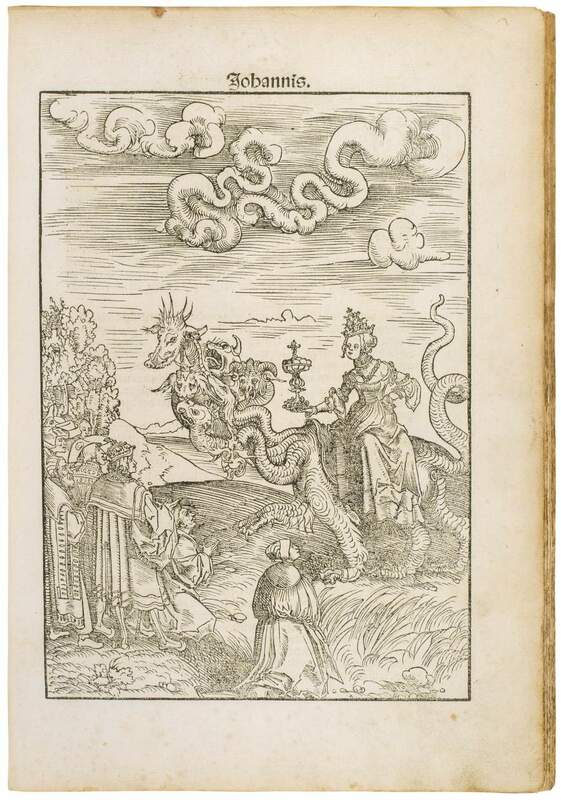 The accompanying monumental woodcut cycle for the Apocalypse by Lucas Cranach makes this first edition of Luther’s Newe Testament Deutzsch a monument of German book illustration and likewise grants the Reformation movement a unique iconographic profile. Although the influence of Albrecht Dürer’s Apocalypse (1498/1511) cannot be ignored, Cranach’s designs follow the meaning of Luther’s translation very closely.